When you stay at this condo in Myrtle Beach, you'll be near the beach, within a 10-minute drive of Ripley's Aquarium and Broadway at the Beach. 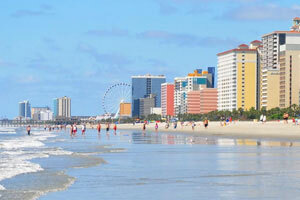 This condo is 3.7 mi (6 km) from SkyWheel Myrtle Beach and 4.7 mi (7.6 km) from Family Kingdom Amusement Park. Make yourself comfortable in this individually decorated condo, featuring a kitchen with a full-sized refrigerator/freezer and an oven. There's a private balcony. A flat-screen television with cable programming provides entertainment, while complimentary wireless Internet access keeps you connected. Conveniences include a microwave and a coffee/tea maker. Enjoy a range of recreational amenities, including an outdoor pool, an indoor pool, and a sauna. Additional amenities at this condo include complimentary wireless Internet access and barbecue grills. Sofa bed linens are not provided, but may be purchased upon check-in. For more details, please contact the property using the information on the reservation confirmation received after booking.